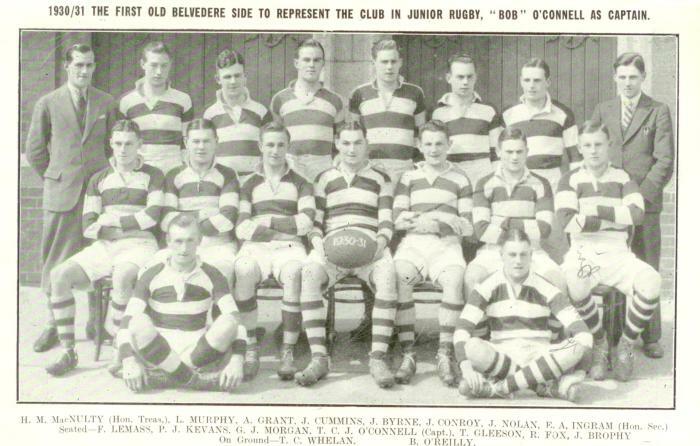 Old Belvedere Rugby Football Club, affectionately known as "The Lodge" was established in 1918-19 at a general meeting, held in Belvedere College. The first match was against Old St Marys at Beech Hill, Donnybrook, a ground shared with that club and won 6-0. The club played in the Dublin League. At the final meeting of that year, it was decided to enter senior rugby and open the club to sister Jesuit colleges and "to outsiders, who may wish to join us." The first senior match was against a now defunct club, Merrion and in all, 21 matches were played with O.B. winning twelve. The first game in the Leinster Senior Cup took place against Wanderers on March 17 1920 and was lost 0-3. Kevin Barry played on the 2nds in that first season. The arrest and subsequent execution of Kevin Barry, the internment of other players, including the Captain, the loss of the ground in Beech Hill and the move to an inferior pitch in Vernon Avenue, and loss of key players during the transition all contributed to the demise of the original club which folded before the commencement of the 1922/3 season. The club was reformed as a junior club in April 1930, restricted to past pupils of Belvedere College and a new ground was leased in Ballymun. The team reached the final of the Junior League in that first season, losing to Bective 11-3. Curiously, this is the only Leinster trophy that has eluded the club in the intervening years. Six future Presidents of the Club played in that final - George Morgan, Eddie Gleeson, Tommy Whelan, Paddy Kevans, John Cummins and Captain Bob O'Connell. The first trophy won was the Metropolitan Cup in 1936 and retained in 1937. These results encouraged the club to apply for senior status which was duly granted for the season 1937/38. George Morgan and Paddy Quinn rejoined the club from Clontarf and George was selected for the Lions Tour to South Africa in that first senior year. Blackrock beat us in the 1st round of the Leinster Senior Cup in 1938 and 1939. Remarkably, Blackrock were again our opponents after a bye into the 2nd round of the cup in 1940. We recorded our first win in the Leinster Senior Cup 11-6. It was the beginning of a sensational run of victories that lasted until 26 April 1947 during which period seven senior cups were won in succession culminating in the loss of the 1947 final to Wanderers. During this time, Old Belvedere fielded what was known as the "Q" backline as all the four three quarters were Quinns'. A highlight of this period was the 12-6 victory of an Old Belvedere selected side against New Zealand Services in December 1946 and it remains the only defeat of a New Zealand representative side in Ireland other than the famous Munster win in 1978. O.B was the first Irish side to play a touring side after the 2nd World War, beating Racing Club de France 6-0 in Lansdowne Road. Several prestigious wins were recorded in the 1950's against Cardiff, Bristol, Wasps, Northampton and Leicester. Floodlights were installed in 1972 and Old Belvedere, under the Chairmanship of Tommy Jordan, inaugurated the Leinster Floodlit competition in 1987 that lasted until 1999. An International Sevens Tournament commenced in 1971 and was played on the final Sunday of the Leinster Season. The tournament often attracted crowds of 15,000 to watch such teams as Loughborough College, London Welsh, Harlequins, London Irish and Richmond play top class rugby in a festival atmosphere. Interest waned in 1997 as the fixture calendar became more congested with the development of professional rugby. The ground lease in Anglesea Road was acquired in 1944 but the first match was not played until February 1949, such was the amount of work required to level and drain the pitches. In June 1949, the old stand in Croke Park was acquired from the G.A.A in exchange for a strip of land required to build the Cusack stand and a superior view of "foreign" games was enjoyed by spectators in Anglesea Road until the demise of the stand in a fire in 1993. The concrete terrace that exists today dates from 1958. The present pavilion was opened in 1962 and the old bar and ballroom were replaced in 1995 after the 1993 fire. The modern playing era for the club commenced in 1993 when the club, coached by Donal Spring and captained by Mervyn Feely won the Leinster and All Ireland Floodlit competitions and the Leinster League, thus gaining promotion to Division 2 of the All Ireland League. The 90's also saw the introduction of the Ladies team. 1st Division status was gained in 1995 and lasted for 3 years. The club again gained promotion to the 1st Division in 2007 and finished top of Division 1B in 2010. In all, Old Belvedere has won 19 Senior trophies and 65 Junior trophies; 14 players have been capped for Ireland and 6 others were war-time internationals. 12 players have been overseas tourists with Ireland. Two members have had the honour of being President of the IRFU (Paddy Madigan and Barry Keogh). Karl Mullen and Des O'Brien have captained and managed the Lions respectively.